More than 25 years ago, Christian Stoll started to build an Acoustic Bass that deserved its name. Unusual volume and playability still made this instrument a legend. With the IQ Bass he once again sets the standard. Like the Steelstring IQ the IQ Bass has a multiscale fretboard. Bridge and head are designed to harmonize to the asymmetrical design. The sound - simply stunning. Anyone who has ever tried to produce a reasonable tone with the E-or B-string of an ordinary acoustic bass, will be amazed about brilliance and perseverance of the IQ Bass. 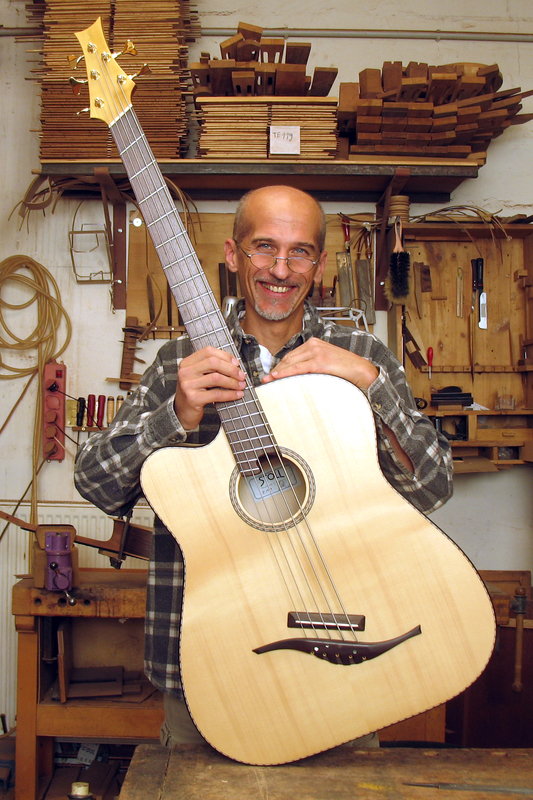 The preview shows two IQ-5-string basses, in the background a Legendary Acoustic Bass 4-string. Christian Stoll holds a left-handed IQ Bass in hand, also a 5-string. The IQ Bass is available as 4- 5- or 6-string.